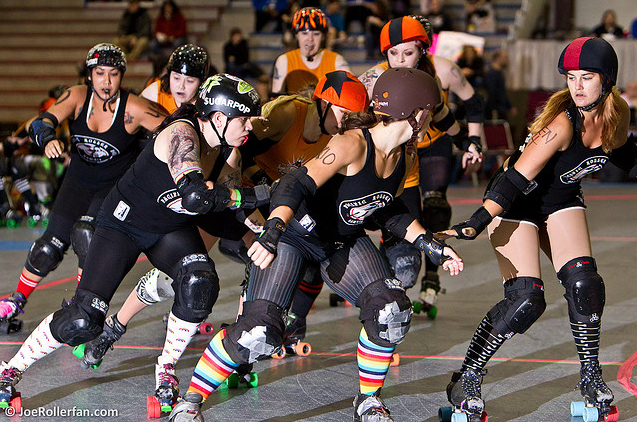 Photo Credit: Joe Schwartz // Caption: Pacific All-Stars Sugarpop, Collideoscope, and Calamity Krush form a wall against the Sin City Rollergirls. HONOLULU, HAWAII – Pacific Roller Derby (Pacific) will host the 4th Annual SK808 Roller Derby Tournament on Saturday, January 7, 2012 at the Papakōlea Community Development Center. This unique live sports event welcomes roller derby athletes, referees, and non-skating officials from the neighbor islands, the mainland, and as far away as Sweden and Germany to compete in a friendly mixed-skill level tournament that allows participants the chance to join together for a day of hard-hitting live roller derby action that promotes athleticism, self-confidence, and team building between members of the world-wide roller derby community. Pacific has partnered with the Papakōlea Community Development Center to host over 60 participants on the make-shift flat-track at the center’s shaded basketball courts. Skaters will be divided into mixed teams by skill-level and bout experience and will quickly adapt to skating with non-familiar faces at this round robin style tournament. For many skaters, the SK808 Tournament will be a continuation of on-skates training time here on Oahu. Many of these amateur athletes plan to attend the Team Awesome Oahu Training Camp, a peer-to-peer coached roller derby clinic led by household names in the derby community, held prior to SK808. Doors for the 4th Annual SK808 Roller Derby Tournament open to the public at 12pm on Saturday, January 7, with numerous bouts between 1pm and 6pm. $7 pre-sale tickets are available at the league website and from Pacific league members. General Admission is $10 at the door; kids under age 10 are free. Street parking surrounding Papakōlea will be available on a first come first serve basis, with additional parking available at the Robert Louis Stevenson Middle School at 1202 Prospect Street, ten minutes by foot from the SK808 venue. Please visit www.pacificrollerderby.com for online tickets and parking details. Pacific wishes to thank SinCitySkates.com, Fast Girl University, and Team Lally Real Estate for supporting SK808. Organizations interested in sponsoring upcoming events and individuals interested in volunteering for this and future events are welcome to contact (530) 848-0147 for more information. For more information on Pacific Roller Derby and SK808, please visit www.pacificrollerderby.com.